The Coalition works with over 65 partner organizations to strengthen community nonprofits, build wealth in urban communities, develop the skills of disadvantaged youth and young adults, and create strategic partnerships to help shape public policy and deliver programs that respond to urgent community needs. Sharmain has been with the UAC since 1999, and is the organization’s first female President and CEO. In addition to her role at the UAC, Sharmain is also the founder of the West Oak Lane Charter School, as well as the Arise Academy Charter High School, which is the first public charter high school for youth in foster care in the country. 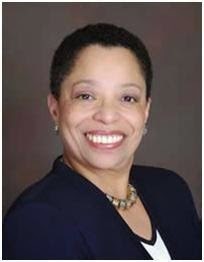 She sits on the board of 10 of the city’s most influential and important commissions, and was appointed by Mayor Michael Nutter to serve as the Co-Chair of the Advisory Committee for the Office of Economic Opportunity in 2010, which improves contracting opportunities for women, the disabled, and people of Color in Philadelphia. Sharmain has been honored countless times for her work in social change and economic opportunity. It will be a great honor to host Sharmain at the College. We will be sitting down with her for a more in-depth interview about her experience as our keynote speaker in the coming weeks. Stay tuned to the blog for that and more on Commencement 2014!